Pumpkin Ale. The utterance of these three syllables is banned in most circles of beerdom. Or provokes puzzled, bewildered looks among Danes. The expression is prone to responses of moaning rejection – like suggestions of doing homework, taking out the garbage, or, worse, running for the sake of ‘exercise.’ The cause of this aversion…(which is how I feel about licorice!) this seemingly involuntary reaction and triggering of one’s gag reflex? Allspice. Nutmeg. Cinnamon. In Heavy Handed and non-rational quantities. Not so distantly removed from thoughts resembling ‘Christmas in a bottle.’ One must wonder how many brewers drink their own spiced ales? 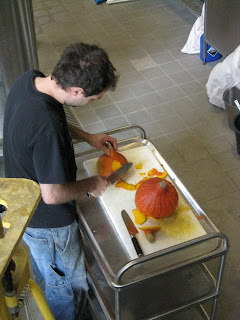 Admittedly, I am not a fan of this style – thus, when confronted with the challenge of creating a pumpkin beer for the birthday of a beer enthusiast (the first commercial pumpkin beer ever produced on Danish soil, I believe), I immediately contacted the one person that I know loves pumpkin season: Will Meyers. 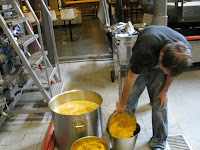 I think Will must brew 25 or so batches of The Great Pumpkin at Cambridge Brewing Company each Autumn. He probably even begins dreading the following year’s ‘Pumpkin Season’ before the current one has begun. 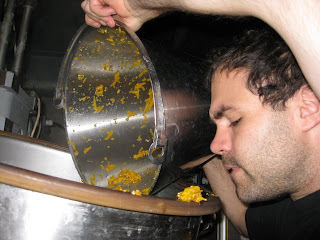 “Do you have any advice for me on brewing a Pumpkin beer?” Will’s customary sense of humor could produce only one response: “Don’t.” Eventually, I was able to procure a few suggestions that would help me in my endeavor. My goal: A complex Belgian style pumpkin ale with little to no spicing. Well, the pumpkin spirit either sojourned with all of the existing tricksters, leading them astray for the day, or ravaged them into noncompliance with its haunting glow! We added 50kgs of julienned pumpkins (with a gravity reading of 5 Plato – that’s just 50 grams of sugar per liter of solution - hardly worth all of the work!) 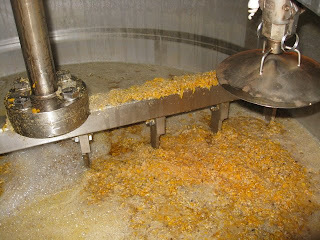 to the lauter/mash and began running off into the kettle. Magically! It was one of the best run-offs I’ve had at Nørrebro Bryghus. A fair dosage of brown sugar. 12 IBUS of Northern Brewer. And 30 grams of Allspice. 19.4 Plato. 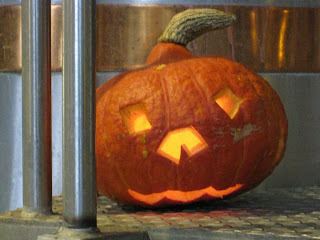 Now, my 8.5% Pumpkin Ale is finishing up fermentation and awaiting my next dilemma: whether or not to add more spices? This beer should go on draft during the week leading up to Halloween. 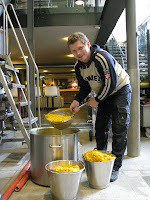 It would also be perfect to place 250L into one of my barrels along with some Brettanomyces - but, I’m short on barrels. Next year, if all goes well, I’ll be brewing this with my own farm raised sugar pumpkins and some homemade maple syrup (wonder who will help me chop up all o’ those pumpkins?) And some of it will go into a barrel. I promise. Pumpkin in a barrel. Sounds wonderful. Or strange. Hey Shaun. 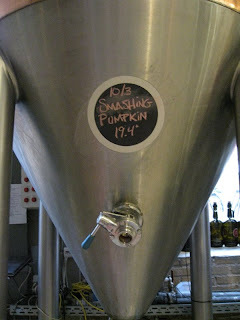 How's the smashing pumpkin tasting? Any left? Still on Draft - just for a few more days. I can save you a growler, if you like, if you think you'll be coming in soon!? I won't make it to CPH until first full week in December at the earliest. Thanks for the offer but I'm sure you'll have something else tasty. Nice blogging BTW...keep it up.